Many tourists visit only Budapest when they come to Hungary, although the vicinity of the capital including county Pest, the Danube bend in county Komárom-Esztergom and the Börzsöny hills in county Nógrád is also excellent for relaxation, recreation or even for extreme sports. The Danube bend is the best example of how nature and man-made creations can live in harmony. 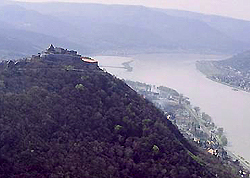 The citadel on the top of the Visegrád hills was King Matthias' popular place - but princess Margaret, who later became a nun, also enjoyed looking at the quick river and the top of the Börzsöny hills. The region also includes the Pilis hills: Pilis-tető (the top of Pilis) is the highest of its steep cliffs, its 757m high summit is the highest point of the Transdanubian hills. In the north the capital is bordered by the 56km2 Szentendre-island starting under Visegrád, while in the south you can find Csepel island, which formerly served as a royal forest-range. Both islands are ideal for relaxation at weekends, but in the north several small and large islands can be found as far as Esztergom: the beaches are calm even in summer, the water rich in fish is ideal for fishing, but the lovers of water sports can enjoy their leisure time here, as well. Visiting the region it is a must to look around in Szentendre. The 18th century townscape is in harmony with the modern works of art, as well as the Orthodox cathedral and the baroque-rococo Main square. Several other lovely settlements can be found in the region: in Ócsa the townscape is dominated by the Romanesque-Gothic provostal church, in Aszód the poet Sándor Petőfi's memory is still preserved, he studied here at the Lutheran Grammar school. The scenery is varied due not only to the river abounding in water but also to the hilly areas of the Börzsöny, the Gödöllő hills, the region of the river Tápió, the Pilis hills, the steep parts of the Buda hills, and as a contrast, to some parts of the Hungarian Plain. If you have time, visit the flat Zsámbék basin by all means or enjoy the view from the steep cliffs of Kő-hegy (Stone hill) in Pomáz or you can even visit the geographical centre of Hungary in Pusztavacs. The Danube-Ipoly National park offers attractions, too, such as animals from water snails to ospreys. Other natural specialties of the region are the alder marshland of Ócsa and the primeval juniper grove. In this varied region you do not need to travel long hours if you wish to visit a spa bath one day and go on a tour in a cave e.g in cave Szemlőhegyi or take a ride in the plains of the region of the river Tápió the following day, but you can also look around in the region by riding a bicycle. If you have had enough relaxation, visit the triumphal arch of Vác, the Calvinist church of Cegléd with its special dome, or even the Christian Museum of Esztergom and, of course, the Basilica, for the dedication of which the Mass of Esztergom was composed by Ferenc Liszt. To the east of Budapest you can find Gödöllő with the magnificent baroque royal palace, Queen Elizabeth's favourite residence, or the Capuchin shrine in Máriabesnyő. 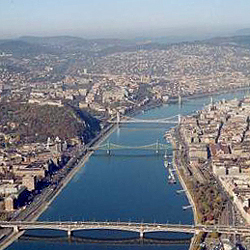 In Buda the districts are surrounded by a range forming a horseshoe from Hármashatár hill to Szabadság hill. Two of the hills, namely Gellért and Vár (Castle) hills have been completely built up. 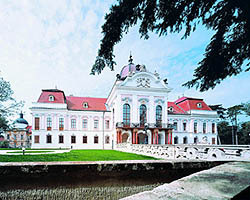 The spa baths of the capital from Császár through Király to Lukács Bath are fed by the thermal springs breaking out at the foot of the hills.